Teleport to the shrine closest to a groupmate, guildmate, or friend. Goto now uses a new API function by default, which should eliminate the problems players who don't use the english client have. You will have to do this every play session. The difference between this and the guild or friends tab is that this addon puts all friend and guildmates in one place, and filters zones you can't fast travel to. You can sort by name or zone. Friend's names are colored green, and groupmates are colored blue. To see more information about a character (such as level, class, or which guilds you share), mouse over the character name. Click a name to teleport to that person. Middle-click any name or close and reopen the map to refresh. This mod is extremely lightweight - only about 300 lines of code. New in version 1.14 - Uses Votan's LibWorldMapInfoTab library. It scales the icons in the map info pane so that many can fit. If you have other addons which make use of LibWorldMapInfoTab and have it loaded standalone, then Goto will use the global instance rather than creating it's own. I advise installing LibWorldMapInfoTab standalone if you use other addons which make use of it. -- Favorite a zone or person so that they appear at the top of the list, just under groupmates. This addon was inspired by Luminary Teleporter which was written by awesomebilly. Props to him for coming up with such a great idea. Seriously, that guy is a fountain of great ideas, like the addon that picks the correct bait for you when fishing. Freaking genius. Goto was written by me completely from scratch, thanks to help from merlight, votan, and circonian from the addon dev forum here at ESOUI. 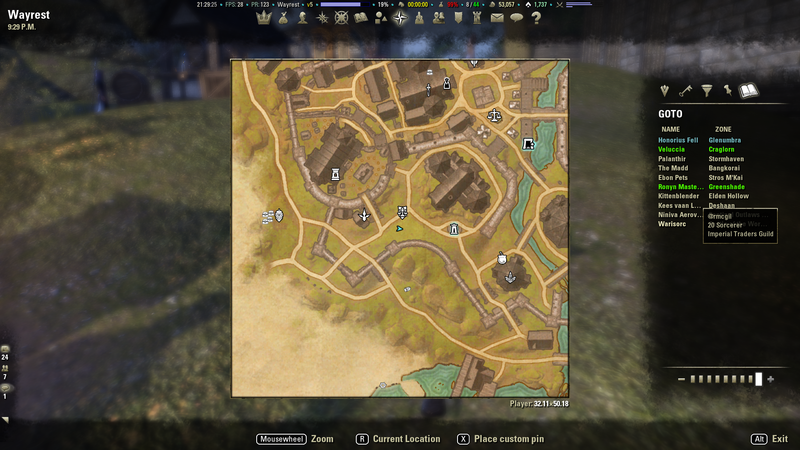 Also thanks to crazydutchguy, whose Atlas addon I studied to learn how to add the map pane. I'd like to maintain creative control, but would love the help if others were so inclined. Mainly I want the addon to maintain it's simple and minimalist style: only show the user information that is relevant to them (e.g. if a friend is not in an area accessible to me, don't show that friend to me in goto). And no huge, clicky submenus to navigate. Thanks to Noobanidus and Chivana for updates and MagiczneTornado for reporting the CP/VR display problem. 1.16 - Zone sort order no longer reverses on each refresh. - other stuff. API 100017. 1.09 - Dark Brotherhood, API 100015, Wrothgar and Thieve's Guild should work again now. 1.07 - Fixed zip archive. Sorry everyone! I couldn't duplicate the problem, so I can't test whether my fix worked or not. 1.01 - Fixed an issue where grouping with someone who does not share a guild with you would cause an exception. Re: LOVE this addon but no updates? Sorry, been in the middle of a move. Update uploaded. Still not updated what am I missing? Is the addon done for? Is there a valid substitute? I'd hate to see it go as I use it all the time. LOVE this addon but no updates? I see on your 'To Do' list is adding 'Favorites' functionality. This would be awesome since I have characters that regularly run between different locations... especially my 'shopper' character who travels between Trade Guild locations. ever thought about adding this for the gamepad interface? The new method for displaying potential travel targets uses an api function that is somewhat buggy. It will show you people in trials, 4 man dungeons, solo zones etc where you can't actually travel. The good news is that this new version should resolve the problems people were having with the non-english client. Exact, Works perfectly in French now!!! Testing Clockwork City now, will probably be uploading an update for it later today. Hi, i ve seen some people alrady notice to you, we miss Wrothgar, Golden Coast, VVardenfell etc etc if we aren t playing in english client, is there a way i can help for Translate something? Becuse i dont know how to do a add-on but your add-on is so good to have, and if i can bring some help tu get it funcionnaly for French Client it will be with pleasure. I appreciate the offer, and I may have to take you up on it. Though I hope I don't have to. Last edited by Bayerithe : 10/23/17 at 12:33 AM. Is there a way to sort by descending alphabetical location order instead of ascending? Yeah clicking on the zone heading should change the sort order. thank you very much for your addon and for your efforts, I'm almost exclusively traveling using GoTo. I'm in 5 guilds, not sure if you pull all players or just selected ones. I bet the DLC zones not showing up are a localization problem. I will try to fix it. Non DLC locations sometimes do not show up even if localization isn't an issue. Pretty much the only ones that can are the normal/silver/gold zones and sometimes sub-zones of those. Unfortunately there's not much I can do about that. Last edited by Marazota : 09/01/17 at 05:40 AM.